Find out where this staple of Vietnamese cooking came from, the different cuts of beef in the broth and how it became such a culinary hit in the UK. With entire restaurant chains dedicated to the seemingly simple Vietnamese soup pho (pronounced fuhr), it’s safe to say the dish has taken hold in the UK. With its flavourful spicy broth, silky thick rice noodles, various chunks of beef and a plethora of garnishes added right before eating, we’ve fallen head over heels in love with the stuff. While it’s been popular since the late 1970s in the US, it took a little longer for it to make its way to the high streets of Britain. Today, however, we can order a bowl from a Vietnamese restaurant or even cook it at home using ready-to-cook kits from the supermarkets. But how did this noodle soup, born out of necessity in a (until recently) relatively secretive Asian country, come to have such a demand in the West? For the national dish of Vietnam, the origins of pho are quite hard to pin down. What we do know is that it appeared around the same time the French conquered Vietnam in the 1880s – before then cows were never slaughtered for meat as they were too valuable as working animals in the rice fields. It was certainly an established dish by 1910, when a French official commissioned artwork depicting everyday life in Hanoi; several of the pieces referenced street vendors selling pho. Today, it’s generally agreed that pho began as nothing more than a bowl of broth with noodles and beef, and was popularised by Chinese who had travelled to Hanoi from Yunnan looking for work. As the city grew so did the number of pho street vendors, and it quickly became a popular dish. The name of the soup itself could come from many sources. The full name for ‘beef and rice noodles’ in Vietnamese is nguu nhuc phan, which might have been shortened to pha or pho by competitive street vendors. It could also have come from the French word feu (fire), a theory that’s backed up by the fact that onion and ginger is charred before being boiled in the broth – a technique also used in the classic French dish pot au feu. When Vietnam was split into North and South Vietnam after French rule ended in 1954, the second evolution of pho began. 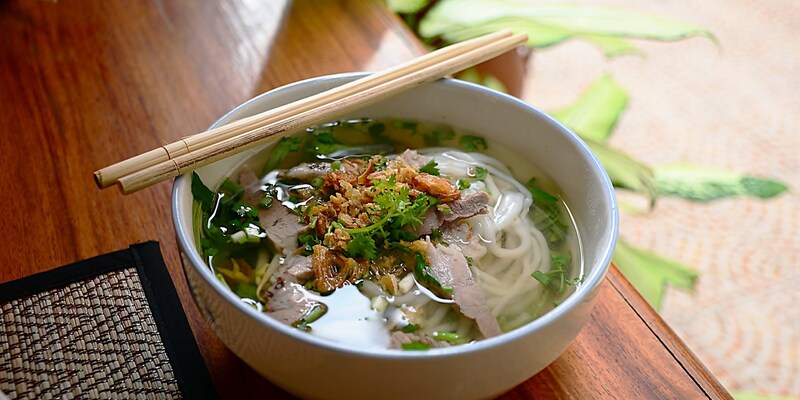 With Communism taking hold in the north around Hanoi, many moved south and brought their famous noodle soup with them. The food culture in places like Saigon (now called Ho Chi Minh City) was very different than the poorer north, and cooks started to add lots more ingredients into the soup like beansprouts, herbs and lime juice to cater to local tastes. This shocked and almost angered the northerners, who felt the secret to a good pho was a perfectly balanced yet simple dish of beef, broth and noodles. The final chapter in the history of pho began in 1975, when Saigon was conquered by the North during the Vietnam War. This led to masses of southern Vietnamese refugees making a new start all over the world and in turn introducing dishes like pho to new international audiences. 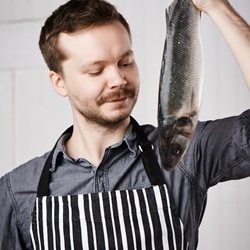 As traditional Vietnamese ingredients weren’t always available abroad pho started to be made with alternatives, while non-Vietnamese chefs began to play around with the original recipe to create their own versions. It became particularly popular in the US, Australia, Malaysia and France (where most Vietnamese refugees relocated), and the soup eventually gained popularity worldwide. The original beef pho is thought to have been inspired by a noodle soup containing pieces of water buffalo, but today you can find chicken pho, pork pho, seafood pho, vegan pho – anything that can be put in a spiced broth with noodles will have been called pho at some point. Proper pho, however, will always be beef-based (known as pho bò), with a stock made from simmering beef bones alongside charred onions, blackened ginger and spices. The actual pieces of meat used in the soup were originally offcuts that the French didn’t want, but today there are a variety of different cuts. Bò chín: sliced cooked steak. The most common inclusion in pho, this is cooked lean slices of beef that take on the flavours of the broth. Bò tái: sliced raw steak. For something a little less well-done, you can ask for your bò to be brought to the table raw. A few seconds in the hot broth will cook it until rare. Gãu: fatty brisket. The meat is simmered for hours in the broth until very soft and falling apart. Nam: flank steak. This can either be cooked rare at the table in the soup or served sliced and well-done in the broth. Bò viên: meatballs. Very dense, flavoured with little pieces of beef tendon and cooked in the broth, these meatballs are often taken out of the soup and dipped into various sauces to be enjoyed alongside the soup. Duôi bò: oxtail. Not only does this add soft, slow-cooked pieces of meat to the pho, it also makes the broth extra fatty and flavourful. Gân: tendon. Harder to find outside Vietnam, this is a popular addition to pho as the slow simmering of the tendon makes it soft and gelatinous. Sách: tripe. Another traditional inclusion that may be hard to find except in the most authentic pho restaurants.